For a frigid little space rock at the arse-end of the solar system, Pluto is full surprises. Ice volcanoes, hazy skies, vast plains of churning nitrogen, what’s next? Just maybe, a subsurface ocean. Perhaps the most incredible discovery of the New Horizons Pluto encounter last summer was that the former ninth planet is geologically active, with widespread evidence of tectonic activity across its icy surface. This pretty much flies in the face of everything we’d expect for a world so small that sits so far from the sun, and planetary scientists have struggled to explain it for the better part of a year. A modelling paper published this week in Geophysical Research Letters offers a simple but fascinating explanation: partial freezing within a subsurface, liquid water ocean. “Our model shows that recent geological activity on Pluto can be driven just from phase changes in the ice—no tides or exotic materials or unusual processes are required,” lead study author Noah Hammond said in a statement. The idea of a liquid water ocean on Pluto isn’t new. We now know that Pluto’s surface consists of a layer of so-called volatile ices, including nitrogen, methane, and CO2. It’s also widely accepted that these exotic ices are merely a dusting atop a much thicker, water-based mantle that extends all the way to a rocky core. Most of that mantle is probably frozen—but it’s possible that a layer hugging close to the hot core is still liquid. 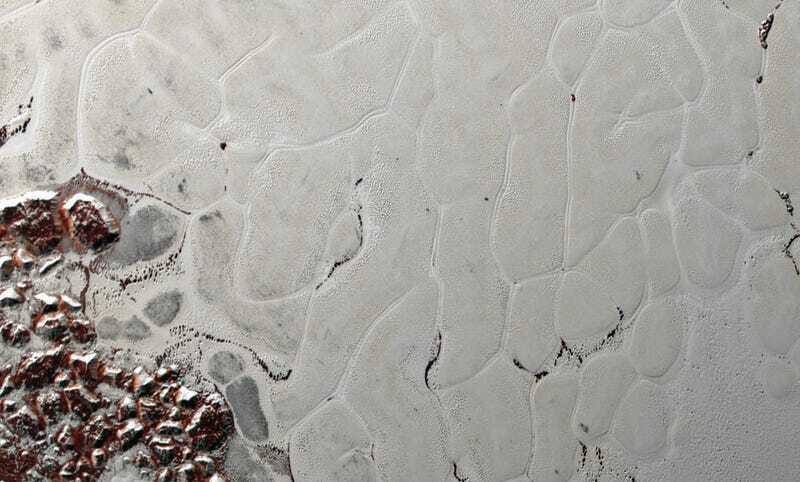 What’s significant about the new study is that it finds evidence for a liquid water ocean today in the tectonic scarring seen on Pluto’s surface. Specifically, the absence of compressional tectonic features—which would form if the innermost layers of water had frozen into a dense form of ice known as ice II—suggests that Pluto may not be entirely solid. If Hammond’s models turn out to be correct, they raise the exciting possibility that subsurface oceans are a common feature throughout the icy rocks littering the Kuiper Belt. Whether any of these exotic oceans could support life as we know it remains to be seen—but it’s all the more reason to keep sending space probes out there to explore.